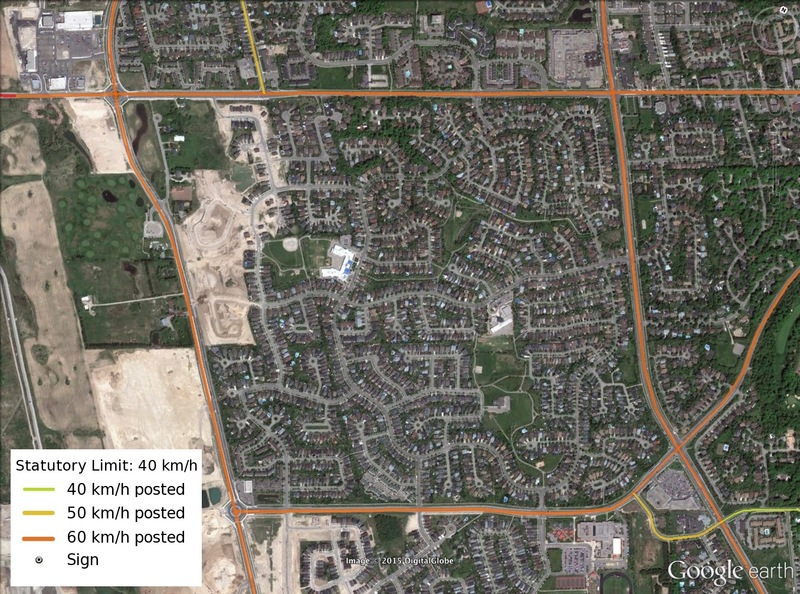 What would a 40 km/h limit mean for Ontario? Introducing the concept of a “speed limit zone” where speed limits are assigned to areas within a city, rather than each individual street. Because none of the articles really explain the significance of these options, I feel the need to explain these concepts myself. (f): the posted speed limit. Put simply, the legal limit is the speed indicated by speed limit signs. If there is no speed limit sign then the statutory speed limit applies, which is generally 50 km/h in urban areas or 80 km/h in rural areas. Changing the statutory speed limit on a province-wide basis would simply involve changing clause (a) to read “40 kilometres per hour” rather than 50. Either way, the change would only affect streets which lack speed limit signs. For the most part, these are local streets. Most arterial roads have speed limit signage, even when the limit is 50 km/h. They would therefore be unaffected by a change in the statutory speed limit. Under our current framework, a speed limit sign applies to a given street. So if we want to introduce 40 km/h limit throughout a neighbourhood, every single street needs to have signs. Zone-based speed limits are the typical way of introducing neighbourhood speed limits in Europe, though their standard is 30 km/h (20 mph in the UK), not 40 km/h as in Québec. Here’s how each method would be applied in order to lower the speed limit in a residential block of Waterloo to 40 km/h. The example here is bounded by Erb St to the north, Fisher Hallman Blvd to the east, University Ave to the south, and Ira Needles Blvd to the west. The Boardwalk is under construction in the southwest corner of the map. Here are the current posted speed limits in the area, including all speed limit signs. Note that only the local streets are controlled by the statutory 50 km/h limit. There are currently 4 signs controlling speeds within the neighbourhood: a “Maximum 40 Begins” and “Maximum 40 Ends” sign for each of the two school zones. 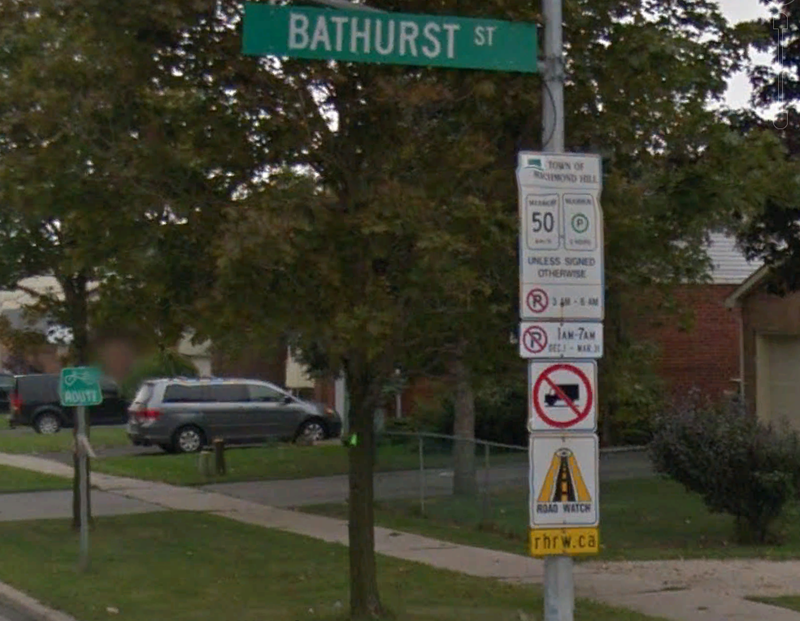 Under the current framework, if we wanted to reduce neigbourhood speed limits to 40 km/h, we would need to post signs on a street-by-street basis. We probably wouldn’t bother posting speed limits on very short streets. The above scenario requires 32 “Maximum 40” signs within the neighbourhood. If the statutory speed limit were lowered to 40 km/h, no speed limit signage would be required at all. Even the existing school zone speed limits would be removed. This change would affect almost all residential streets. With a 40 km/h zone, signs would only need to be posted at the entrances to the neighbourhood, and would apply uniformly to all streets within. The above scenario uses 15 speed limit signs: a “Maximum 40 Zone Begins” and “Maximum 40 Zone Ends” sign for each of the 7 entrances, and a “Maximum 40” sign for the cul-de-sac directly off Ira Needles. In all of the coverage about this development, all sources other than the CBC explained the options using language that was ambiguous to the general populace. It is therefore unsurprising that almost every single comment regarding the province’s speed limit review been a rant about existing posted speed limits – a topic that is completely irrelevant to the methods being considered. Some news outlets seem to be even aiming to spark outrage in readers by using sensitive keywords like those in the Global News Toronto headline proclaiming “Speed limit debate tries to slow down traffic in Ontario”. I guess we can always count on the media to sensationalize a story, because they profit from clicks and views, not from spreading correct knowledge. It’s fairly safe to assume that a factual article on the signage policy review would not have caused anywhere near the sensation that these articles have. This post doesn’t specifically relate to cycling or Waterloo Region, although it does affect both. To expand the scope of my writing, I will be starting my own blog where I post about general Ontario traffic issues such as this one. One bicycle-specific thing I did learn while researching this post is that speed limits do not apply to bicycles, since they are not “motor vehicles”. Excellent post. The only news I’ve listened to so far was an interview on CBC Radio, but the discussion revolved more around some perceived notion about the financial impact to the economy that lower residential speeds would bring, instead of what is entailed. Narayan, when you graduate and get your urban planning degree, please come to work in Guelph. Love your posts. You can do a lot of good around here! That’s a really high compliment, thanks! I’m actually quite fond of Guelph, it’s probably my favourite small city in Ontario. I really like how the already-nice and unique downtown has been getting even nicer over the past few years.